* We used pork liver for a dinner at River Run Farm & Pottery, which was delicious. It’s recommended frequently that pork and beef liver be washed and soaked in milk for at least 2 hours before cooking. Wash chicken livers under cold running water. Dry well, and season with salt and pepper. Dust chicken livers with flour; set aside. In a large nonstick saute pan, combine olive oil, onion, sage, chopped garlic, red-pepper flakes, capers, and anchovies. Cook over medium heat, stirring frequently, for 3 minutes. Add chicken livers, one piece at a time. Cook, covered, until evenly browned, about 3 minutes on each side. Add Vin Santo, scraping the brown bits from the bottom of the saute pan. Cook until the wine has reduced by half, 2 to 3 minutes. Stir in tomato, and cook, stirring occasionally, about 6 minutes. (The dish should be slightly soupy. If it starts to become dry, add a little water.) Remove the saute pan from the heat, and stir in parsley. Rub the toasts with the whole garlic clove. Drizzle with olive oil, and season with black pepper. 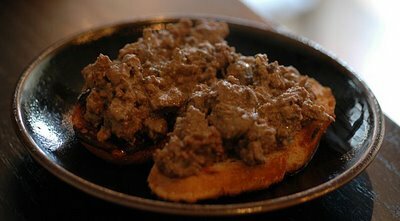 ** Spoon the livers over the toasts, and serve immediately. ** Put chopped garlic in the 3 tbsp of olive oil before you start. Then you can just brush on the garlic olive oil and avoid the extra step. ***Marsala can be a bit sweet for this. If you have kids, they will probably love it, but next time I will try something else. Mario Batali has a similar recipe and he uses Chianti which sounds good. Also, Madeira might be nice. ****I cut the pork liver into almost bite sized strips and they were too big. Try 1-1/12 inch pieces and cut the toasts into manageable pieces as well. Or, you can mince or puree the entire mixture, which would make a great hors d’ouvre spread on mini-crostini. Anastasia is a former media producer who hit the road to sustainability in April 2013 with her husband JC and Mattie, the dog. She writes about food, community, sustainability, travel, family and the myriad questions that boggle them.